I’m really excited to share this one with you. What’s a fantasy novel without a map, knowwhatimsaying? 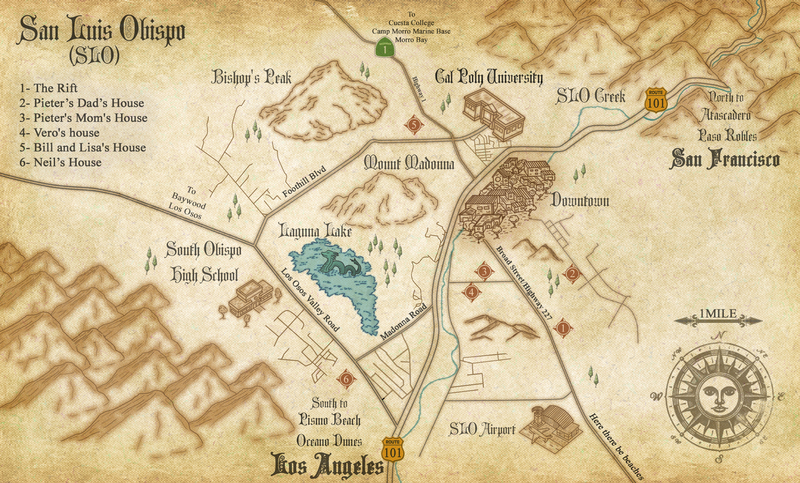 Weeeell, recently, I had a map designed of San Luis Obispo. It’ll appear in future editions of the book. Please share this, especially if you live in the SLO area. I think locals will get a kick out of this. If you haven’t started the series yet, you can download the first one for free right here! Book 3 has some fun Neil moments. I’m working on the edit process and have come across some colorful ones in the last couple days. These aren’t major spoilers, just a couple fun lines. Still, you’ve been warned. Book 3 is progressing. ‘Nuff said. And yes, the shark does explode at the end. It was stuffed with dynamite by the Joker.